It used to be when public officials changed their minds on an issue they were called ‘flip-floppers’. No one wants to be called a flip flopper. Better to double down on whatever misguided belief you’ve been hauling around since forever rather than risk that dreaded term attached to your name (see ref. below). Thankfully, nowadays public officials feel free to change their minds without fear. Changing one’s mind is now called ‘evolving’ and not only is it not a bad thing – it’s a very good thing! It’s a sign of a nimble mind, flexibility, willingness to see other perspectives, to self-reflect -- courage, even. Congratulations to the FICSA President, Diab El-Tabari, for changing his mind . 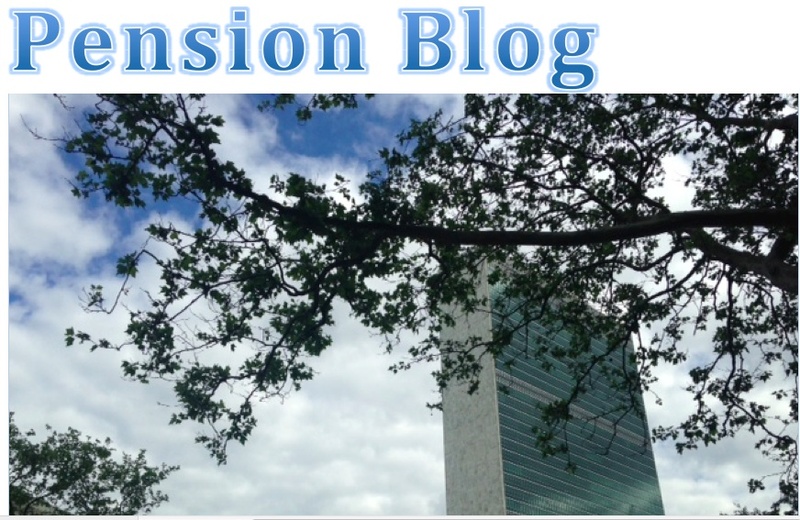 . . um, ‘evolving’ on important matters affecting the UN Pension Fund. On 20 May 2015 (posted below), Mr. El-Tabari wrote about the 8 May 2015 petition addressed to the Secretary-General asking him to oppose proposed changes that could breach the system of checks and balances necessary for the health of the Fund (see link to petition on this blog, and sign the petition if you haven't already done so). Concerned AFICS members, wishing to set the record straight about the petition, not to mention offer an assist to Mr. El-Tabari, quickly wrote to the FICSA President (letter of 20 May, posted below) suggesting he please re-read the petition. In his own letter to Mr. El-Tabari, the CCISUA President went a bit further, suggesting that Mr. El-Tabari might actually wish to retract his letter. Mr. El-Tabari apparently did not wish to do so. In the meantime, the AFICS leadership happily posted the letter on its website where it sits to this day in splendid isolation since neither our letter to Mr. El-Tabari nor his latest letter, in which he did the aforesaid evolving, has made the cut. "With friends like these. . . " some were heard to murmur. Back to the evolving. When the FICSA President evolves he goes for broke. No doubt the CEO is wistful for the days of mere “breaches in promotion and favourtism. . . misuse of funds” contained in the previous letter. This new letter, dated 29 June 2015 (posted below) pulls no punches. We’ve all heard about the draft MOU between the Fund Secretariat and OHRM that the CEO fervently desires that allows him certain ‘administrative flexibilities’ over staff promotion, mobility, retention, and classification of posts, and more. In his latest letter, Mr. El-Tabari recalls that the Pension Board had requested the CEO to review the MOU to see where adjustments could be made to address concerns of slowness in recruitment. In other words, the CEO who had been offered an inch, is reaching for a mile. Mr. El-Tabari also recalls that last year, a draft ST/SGB was produced by a CEO/RSG (Representative of the Secretary-General for Investments) Task Force that would have delegated the Secretary-General’s authority wholesale to the CEO for management of Fund staff. It was, mercifully, not implemented. And it’s not the whole story. The unimplemented ST/SGB (dated June 2014) would also have allowed the CEO to achieve what he wants from the new MOU: wrest from the RSG authority over staff in the Investment Management Division (IMD), in other words, breach the current split between the Fund Secretariat and the IMD, a major cornerstone of the healthy operation of the Fund. Why is this delegation of authority necessary, Mr. El-Tabari asks. In fact, he wonders, why is a new MOU necessary since the current MOU allows all the administrative flexibility that’s needed? Noting that the Fund represents the “most important benefit enjoyed by UN staff” Mr. El-Tabari requests the Secretary-General to bring all parties together (CEO, RSG, OHRM and Fund staff representative) to achieve the needed objectives of efficiency, effectiveness and transparency in Fund operations. Bravo, Mr. El-Tabari for your valuable service to all Fund participants and beneficiaries in setting the record straight. We applaud your evolution. Now, please go one step further by asking your friends at AFICS how come they were so quick to post your 20 May letter on the AFICS website and so slow to post your latest letter. Ask them to post this letter without delay! Tell them it's good for our pensions, good for you, and good for AFICS -- an all round good thing!